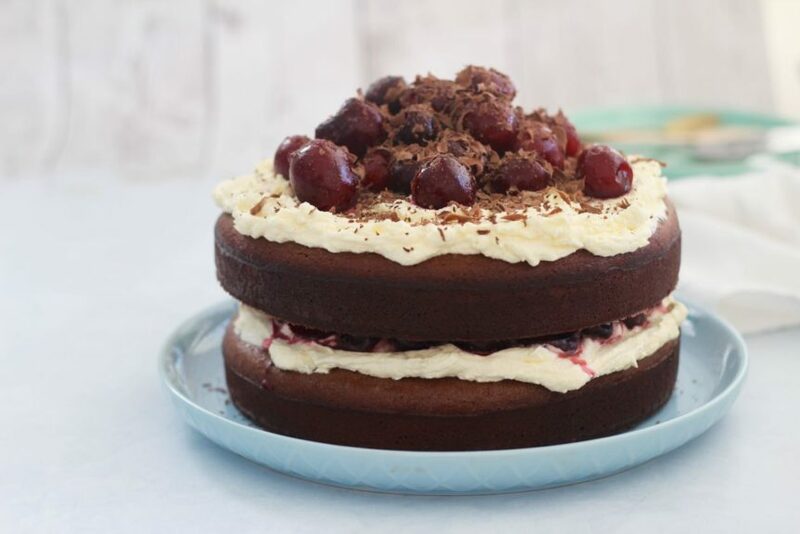 Sugar free and gluten free Black Forest Cake Recipe! YUM! YAY! 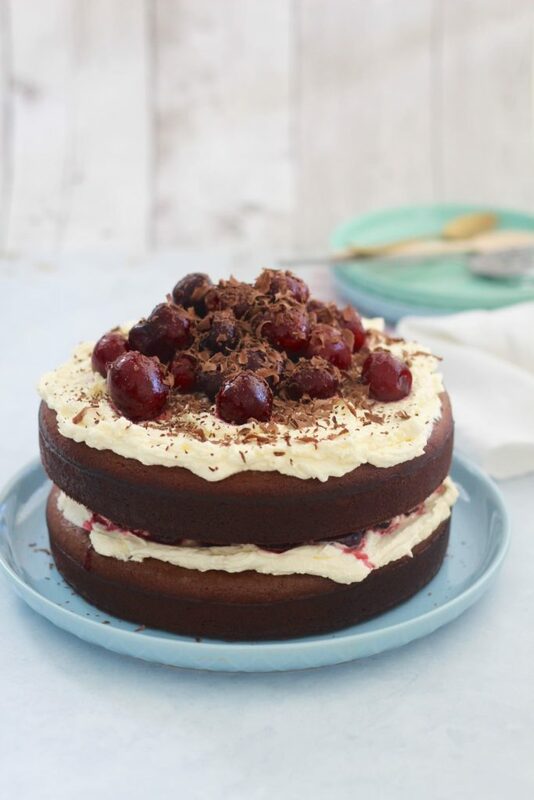 Sugar free and gluten free Black Forest Cake Recipe. Epic and freaking delish! Stop the freaking internet because we made the best sugar free and gluten free black forest cake you’re ever gonna taste! We’re serious. We blew our own taste buds with this epic double decker of goodness! Especially when it’s sugar free and gluten free black forest cake! You’re welcome! We vote it’s the PERFECT cake for Mother’s Day! This year it falls on Sunday, 14 May and if you haven’t already got your Mumma bear the best gift ever… we’ve got you covered! When you get a book (ordered before 8 May 2017), not only will we gift wrap it and confetti bomb it… we’ll also add a special Mother’s Day quote card (that says ‘I won the mum lottery’) and a beautiful rose quartz crystal to celebrate the love you have for your mum! 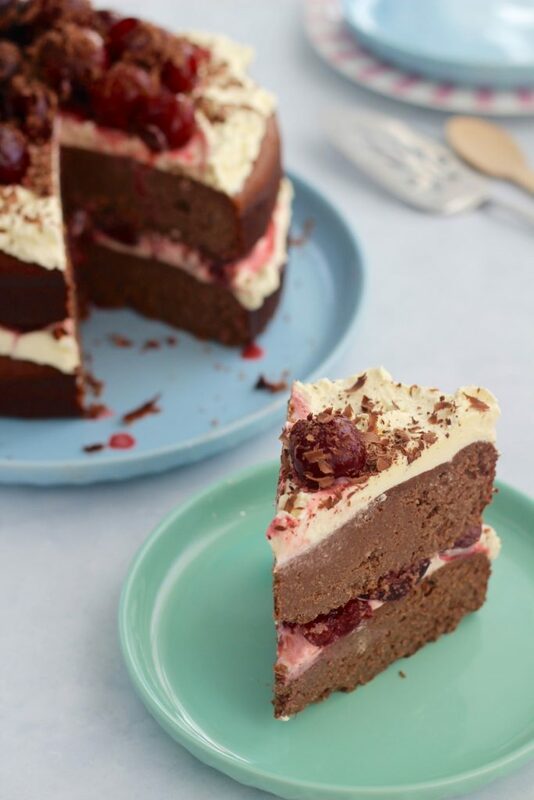 So with the most delish healthy black forest cake ever AND a copy of our Get Merry cookbook, we’re pretty sure you’re gonna win the best kid award. If you make this delightful cake of goodness be sure to share a pic on social media! 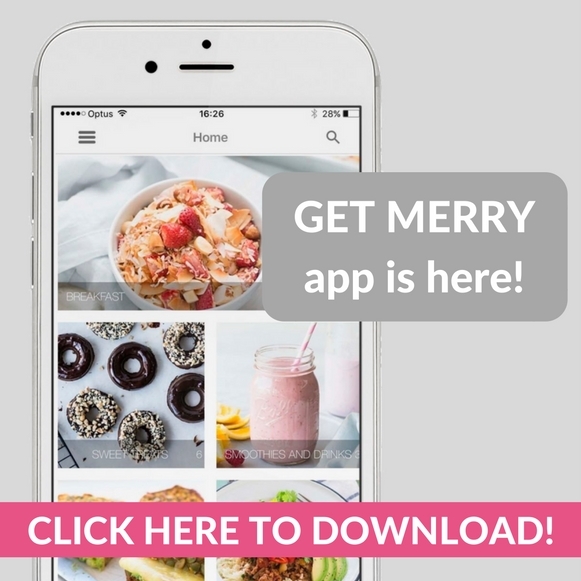 Use #GetMerry so we don’t miss it yah! p.s if you skimmed this post (oh you missed out :P) we’re adding bonus rose quartz crystals and quote cards to all Mother’s Day book orders! Press to order yours! 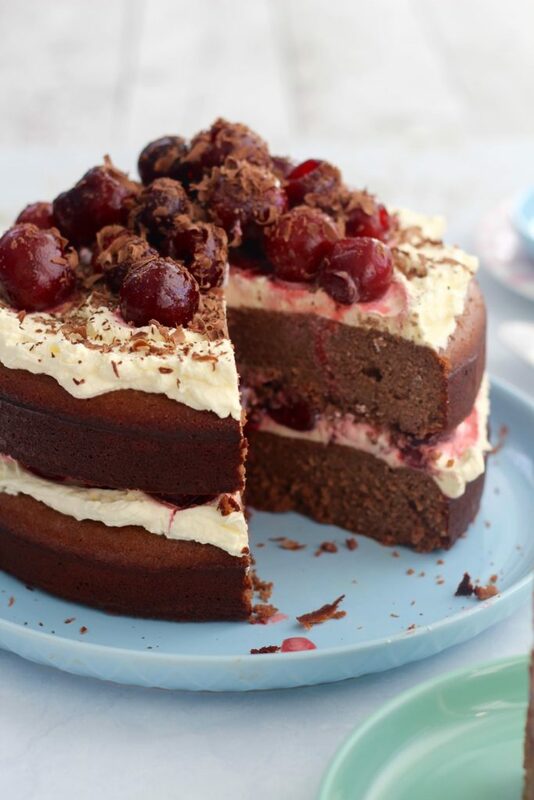 AND you should make this sugar free, gluten free black forest cake STAT. Preheat oven to 180°C (350°F) and line 2 x 20 cm (8 inch) spring form cake tins with baking paper. Remember you can halve the cake mixture and just make 1 cake. In a large bowl combine the almond meal, cacao and baking powder. In a blender or mix master on low speed, whiz the coconut milk, nut butter, coconut oil, rice malt syrup, eggs and vanilla together until smooth. Pour this into the large bowl with the dry ingredients and gently mix together. Add the melted chocolate and mix again. Divide the batter into the lined tins and bake for 30-35 minutes or until lightly brown. Allow the cake to cool completely before turning out. For the toppings, whip the cream until nice and fluffy (omg how good is whipped freaking cream?). Place one cake on a plate, top with half the cream and half the cherries (we halved these cherries to make it a nice flat surface for the next cake!). Carefully place the other cake on top, squish down a little. Spread the rest of the cream on top of the second cake, followed by the rest of the cherries and freshly grated choccy! You can halve the cake recipe and just make ONE cake instead! It's a BIG cake! Don't like cream? Leave it off and drizzle with melted chocolate instead. You CAN freeze this cake into separate slices, it's just that the cream won't be that fresh anymore when you defrost.